This is the story of how a Baggins had an adventure, and found himself doing and saying things altogether unexpected . . .
Bilbo Baggins is a hobbit who enjoys a comfortable, unambitious life, rarely travelling further than the pantry of his hobbit-hole in Bag End. But his contentment is disturbed when the wizard, Gandalf, and a company of thirteen dwarves arrive on his doorstep one day, to whisk him away on a journey 'there and back again'. They have a plot to raid the treasure hoard of Smaug the Magnificent, a large and very dangerous dragon . . . I've lost count of the number of times I've read The Hobbit over the years, it was the book that started my love of all things fantasy and it was always a go to book that I could read again and again as I was growing up. It must have been at least 5 years since I last read it though so I wanted to pick it up again before going to see the movie. It doesn't matter how many times I pick it up I still love it as much as the first and it always surprises me how many little details I forget between readings. I know that most people have already read the story but if you're one of the few who haven't then I'd highly recommend it. It's a great story for adults but I also think it makes fantastic bed time reading with children because it's such a fun adventure story. There is a reason it's considered a classic! The last thing Bilbo Baggins is looking for is an adventure, he is quite happy living in his hobbit hole enjoying plenty of food and good company when he wants it (which is not too often thank you very much). 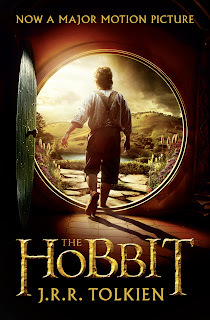 When Gandalf arrives with a party of thirteen dwarves Bilbo is convinced they have come to the wrong person for help but the more he learns about their quest to re-claim their lands from the dragon who stole them the more curious he becomes and in the end he can't resist joining them. Bilbo is the least likely of heroes, he doesn't consider himself particularly brave or smart and he has practically no experience of travelling or fighting, but when it comes down to it the dwarves wouldn't have got very far without him. I always enjoy seeing Bilbo reach is full potential, he goes on a journey of personal discovery and proves to everyone just what a strong character he is. The story isn't as dark or scary as the Lord of the Rings books are and is suitable for a younger audience but it is still quite scary in places and the scenes with Gollum are particularly creepy. I love the riddle contest between Bilbo and Gollum but have to admit that I'd be hopeless at figuring out the answers myself if I was in Bilbo's place! The Hobbit is such an enjoyable story and a great introduction to the Lord of the Rings books, I really think I'm going to have to re-read those this year too! I mentioned that my main reason for re-reading the book was because I wanted to go and see The Hobbit movie. My Dad, brother and I are all huge fans of the Lord of the Rings films and going to see them was always a family outing so we wanted to carry on that tradition with The Hobbit. As much as I love the LoTRs movies they had to leave out quite a lot of events because of the pure scale of the world building in the books - there was no way to fit it all into a 3 hour film even if they wanted to - so I was really pleased when I found out that they were splitting the The Hobbit into 3 separate films. The only downside to that is that we are going to have to wait so long to see all of them but if the first instalment is anything to go by then the rest will be worth the wait. I didn't quite manage to finish re-reading the book before we saw the film but I was well over halfway through so I had made it further in the story than the movie does. I have to say I was impressed with how well they kept to the storyline. Yes there were a couple of differences, the main one being Thorin's attitude to Bilbo which I did feel a little disappointed with, but over all they stuck quite closely to the plot and I could see the reason for the changes that they had made. Anyone who has watched the LoTRs films will already be familiar with Bilbo, Gandalf and of course Gollum but I really enjoyed getting to know the younger Bilbo on screen. I also really liked the way they had tied the two sets of films together by starting the story with the older version of Bilbo writing about his adventures and by including both Elrond and Galadriel. I absolutely loved all the dwarves too, I had a little trouble keeping the names straight in my head as I was watching but I think that will come with time and my favourites were without a doubt Bofur & Kili (yes I do have a bit of a thing for Irish accents!). I'm already really looking forward to watching the next two films and will definitely be watching this one again when it comes out on DVD. @ Sarah Elizabeth - It's nice to find another fan of the books :o) I have to admit that I was really surprised when I found out that the story had been split into 3 movies but I really enjoyed the first part and have high hopes for the next 2!